I decided it was time to do a little housekeeping. The Christmas picture has been retired and in storage till next year. I went to the Carnegie Library of Pittsburgh and decided to look and see if they had the famous Bowser book. They did and I still did not find Olive Bowser. I think I really have to wait until April when the Armstrong County Genealogical Society reopens. Why do they close from November till April? That is a mystery and I will find out when I go back to do more research. Is this week 51 or 52? I have lost track of the time. The first thing to do is evaluate what you have done the past year. I went back and read what I had set for myself. My main goal was to send for death certificates. Actually, my husband and I drove to New Castle PA. I did not know you could not get them in person. It was a nice drive and the Pennsylvania countryside is pretty in the summer. What I learned was to call first, good thing it was only a 30 mile drive. With just these few documents I have started another quest. The biggest surprise was the date on my great grandfather, Thomas Dowd (and the names of his parents) were not what was listed on some of his documents. The date he and Bridget had written on their marriage application was entirely different on his death certificate. The date he had give was indeed belonging to another Thomas Dowd and the parents names were not the same. Is the first Thomas a cousin??? And the first Thomas an uncle of his father, or cousin of his father. To list your date of birth and have it belong to another person of the same name is not random. I also did not expect to find a cousin in Germany. My cousin, AS had started her blog about two months after I and I was so surprised when I got the notice that My Heritage had found 20 some matches. AS's, mother is still alive and she was able to identify my Great Aunts in my Schridde Family Picture. Her mother had lost her photos in the war bombing. I found a lot of relatives. I found the names of two more great great grandparents. That was not part of my goals but it happened. AS was quite happy to get pictures of her great aunts too. I started to search for the two people who my father in law went to place flowers on their graves in Union Dale Cemetery. "Some Civil War Guy" Chuck had said. Turns out that guy was Chucks great grandfather (Robert Stephens), and the second was most likely his son, James Stephens. Chuck did not think he had any relatives who fought in the Civil War. I found, through another cousin, he has a second great grandfather, Darius Anthony, who fought and died in the Civil War. Next, was to find Robert Stephens wife, this one was a process and with the help of people on the Allegheny County Roots Web list I was able to find Olive Stephens and with the help of Chucks aunt I found her in Salem Ohio. On her obit I found the names of Olives parents, Jacob and Mary Bowser from Armstrong County PA. It seems the Bowser Family is quite prominent in Armstrong County. The progenitor seems to be Matthias Bowser who came to the USA before it was the USA, circa the late 17th century. This requires a lot of searching to confirm this fact. Neither of these four people were on my list to do. Jacob and Mary are definitely on my to do list for 2011. I am learning Jacob and Mary Bowser hard to find, in fact, extremely elusive. I know they are there and it will seem quite easy once they are located.. But I have to wait till the spring when the Armstrong County Genealogical Society reopens for the year. I have no formally set new goals but I can sense them into 2011, with the Bowser's on the top of my list. When I first had met my husband, Chuck, he told me that his parents had waited until Christmas Eve and after the children went to bed, the whole house was decorated. Today I received my newsletter from the GERMAN BOHEMIAN HERITAGE SOCIETY and one of the articles stated that it was a tradition that was decorated on Christmas Eve. It seems that the children would visit the house of other and the mother would decorate and when they came home from their visit St. Nicholas or the Christ Child had visited and left gifts. I told him today about the tradition and I guess his family's tradition came from the immigrant Bohemians. He said that nothing was done and when they woke on Christmas Day the tree and decoration, inside and out were done. It was magical. After the kids were grown, all the sons would meet at his parents home and exchange gifts after midnight. We would eat after everyone would arrive. We would have cold cuts, cheese and salads. I had baked Christmas Cookies and would bring a large box of the treats for the occasion. While his parents were alive we would spend Christmas Eve at his house and Christmas Day with my family. It made for an easy decision on which house to visit over the Holidays. They have been gone for about 15 years and I really do miss them and the Christmas Eve and Christmas Day celebrations with our families. That today was my two year blogiversary. But thank you to Thomas MacEntee at GENEABLOGGERS I was re reminded today when I did my daily, and sometime more than daily check of his blog. Thomas, I have learned so much from you and the others when I read your blogs. A lot of people out there have been researching their roots for many years and I have just been doing this for a little over two. In these past two years it seems that I have been finding ancestors at the speed of light and some at a snails pace (Olive Bowser) Some of it was done with much research and some was serendipitously. I was really excited to find a cousin who lives in Germany, our grandparents were siblings. She did not know anyone from her family had emigrated to the USA. 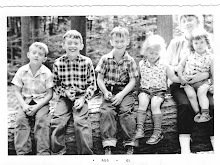 It was confirmed by her mother, who is still alive, and her mother was able to identify the mystery siblings on my family portrait of the Schridde Family. And when I found my great great grandparents (John Doud and Catherine Fitzmorris) on the CONNERS GENEALOGY web page on a list of Roman Catholic Records in Glinsk Parish, County Galway. I wasn't looking for anyone, just my usual perusal of records. I would have not known them if I hadn't recently (Genealogical Mortal Sin) sent for their death certificates after two years. Another suggestion was to obtain my obits and the death certificate at the same time, thank you Nancy at MY ANCESTORS AND ME. I still have not found quite a few obits though. I love to read all of the blogs on my list, and add to them when people have their favorites listed. Perhaps I spend too much time reading, not really. I am still on hiatus from research and perhaps after the Holidays I will get going again. I guess research is like any other activity you learn to do, you get better with practice and help with lots of examples and advice. And all I have done so far is move the daughter, and learn how to insert a photo that now is of a good size. I missed the "shrink to fit" option when I posted the poinsettias. Chuck and Emily are still in upstate PA and I had to come back to work. I wish I could remember what my parents had said about their celebrations of Christmas. I remember that my mother said that they had lighted candles on the Christmas Tree and one of the candles started the tree afire. My grandfather, Willi, threw the tree outside. My father never did say anything except sometimes they would get an orange. With his father dead and my grandmother trying to eke out an existence it would have been difficult. But I do have my grandmothers Nativity Set. I suppose those mysteries will never be known since I am the oldest of the six. My mother did tell me that it was her mother who gave them money to buy us presents so we would have a nice Christmas. My dads mother also bought presents for the children. I wonder now how my parents managed all those years. I, like many others, were poor and we did not know it. I guess we were blissfully unaware. make the picture smaller I decided that I would change the photo a few times. I am on hiatus from genealogy. That does not mean I do not think about it but rather it is on hold until my daughter is moved and settled in the house. But I do have enough time to read everyones blog and enjoy what I may find. I am check the weather forecast for SNOW and I hope everything goes well and no snow for our drive. Since everyones blog is nicely decorated I decided to give mine a try. I like the picture but I have yet to figure out how to shrink the photo, because my blog title is gone. I will play with it later. We all have been getting our daughter ready to move for her new job. The first job after graduation from Nursing School. She has a lot of support from us and as I was thinking about our ancestors. I can not imagine leaving my homeland and just moving across the ocean for parts unknown. What prompted them to go? Was it economic, like our daughter. How long did it take to come to this decision, after Emily got the offer there was a lot of work to do involving housing. Did our ancestors have any idea where they were going? Was there a relative or some of support system for them when they arrived. Emily and I have been packing boxes and moving everything to the garage to be packed in the U Haul truck. Did our ancestors bring much with them., what would be on their list to take with them. This day and age the move will go with relative smoothness, with the exception of looking for a snow storm. It has been interesting moving a child off on her own. But, how was it for the families that were left behind in the old country? Much harder I would think, I can call her or send a text message. One hundred years ago they had to wait for the letter to make it across the ocean to find out how their children were faring. It will prove to be interesting for me and it will give me a lot to ponder about my ancestors moves. We usually had a live Christmas tree. (I missed the first post) and we would decorate it will glass ornaments and lights. Those were the light bulbs that we as big as those 9V night lights. They were very heavy and would weigh the tree branches down. Under the tree there would be a little village with houses, shops, and a church. Little people happily hurrying along there was were also in the village. My dads brother, Richard, had purchased the Lionel Train Set for my brother and I. It would be there every year. A lot of the ornaments were made in Germany or Eastern Europe and one by one they would break. The lights were replaced with bubble lights. They were shaped like a candle and would bubble up in the tube when they got warm. In the fifties an Aluminum tree with bulbs of a solid color was used and it was illuminated with a rainbow, rotating disc that made the tree glow with four different colors; green, red, blue and yellow. One item that was antique, even at the time of my childhood was a paper mache Nativity Set. It belonged to my grandmother, Gertrude O'Rourke Dowd. It was said that they came from OBERAMMERGAU, GERMANY. Many are missing from long ago and I have tried to find replacements but that has not yet happened. After Henry knocked over the tree. "What, why are you looking at me??" After thanksgiving we would start to make cookies. We had an assortment and there were none that would not be eaten. The variety included Chocolate Chip Cookies, Snickerdoodles, Thumbprints, Sugar Cookies, Brown Sugar Cookies, Seven Layer Bars, Chocolate Covered Cherry Cookies and many more. My very best and favorite cook book is the BETTY CROCKER COOKY BOOK This book has never failed. After I got married I started to make the cookies and would freeze them in batches, till one day I discovered that they were disappearing mysteriously from the freezer. Since we had no children at that time I know who to question about that mystery. What I would then do was to pack two Rubbermaid containers with lids and give them to both parents. My in laws on Christmas Eve and my parents on Christmas Day. On Christmas Eve we would have cold cuts sandwiches, a salad or two and cookies. On Christmas Dinner it would be a repeat of Thanksgiving with a turkey and all the trimmings.